One day I was watching “Criminal Minds” and “Law and Order” and I thought to myself, look at how much you can figure out about someone, about yourself, if you take the time to be observant. Then I thought about the recent overhaul I’d given to my room. My decorating scheme was nonexistent. My bed was black and white, my furniture was dark brown. No colors anywhere. Not even shades of gray. No curtains. Nothing on the wall. It’s how I saw my world: starkly, black and white. It’s the room of someone whose spent most of her life ready to move at a moment’s notice. Someone who has no faith in ever getting settled. My father was never in the picture. Even when he got out of jail, he still made no attempt to play a fatherly role in my life. It used to bother me a lot. When I was in the fifth grade, my mother remarried and moved to Mississippi. When I was in Grade 6 and some of Grade 7, I lived down there too. I remember my room. It had a Sponge Bob theme. For some of that year, I lived with my grandmother in Connecticut; some of 8th grade, too. Then it was back again to Mississippi. But I remember coming back to graduate from Cloonan MS. By then, I had decided I didn’t want to spend my time in Mississippi. But transitioning back to Connecticut only brought upheaval. During my high school years, because my grandmother needed to move five times, I moved five times, too. I started off at Westhill, came (temporarily) to Stamford Academy for the remainder of Gr 9. Next, I went to Stamford High, but left to go to Bridgeport where, in Gr. 10, I went to Warren Harding. Then back to Stamford High for some of junior year. For seven months, I had to live with family and friends who really didn’t want me in their homes. Now I’m back at Stamford Academy, where my life has come together. Here is how I did it: For years, I felt alone, that I had only myself to depend on. At first, I thought this placed me at a huge disadvantage. But my Stamford Academy family advocate, Katie Siegel, helped me see that as a strength. Nothing ever goes smoothly. At some point, something always blows up in your face. In the past, I used to panic. Katie helped me sort that out. If you accept that something always goes wrong, then, instead of panicking, you are prepared to implement Plan B. This knowledge gave me the patience I needed to wait out the tough times. It gave me the skills not to rely on people who could not meet me 50:50. That includes my father. It gave me the certainty to finally get around to decorating my room. 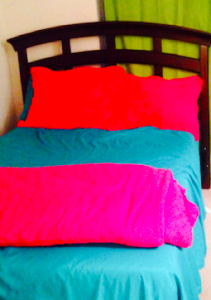 My curtains are lime green, my comforter is furry pink, and my sheets are aqua blue. You don’t need a degree in forensics to see I’m happier. I even have mirror now so I can see myself. I see beauty. I see confidence. I see growth. I see someone who has become good at reading people and myself. I’ve gone from fearing that I wasn’t going to graduate to loving school. My teachers give me the one-on-one attention that I need. They check in with me to see how I’m feeling. No teachers ever did that before. And so my room is newly colorful. Like me, it’s still a work in progress. I want to go to NCC and study forensics science with an eye on law school. My name is N—-. I’m 18 years old. My journey wasn’t easy. But now, as anyone can see, I’m on my way.